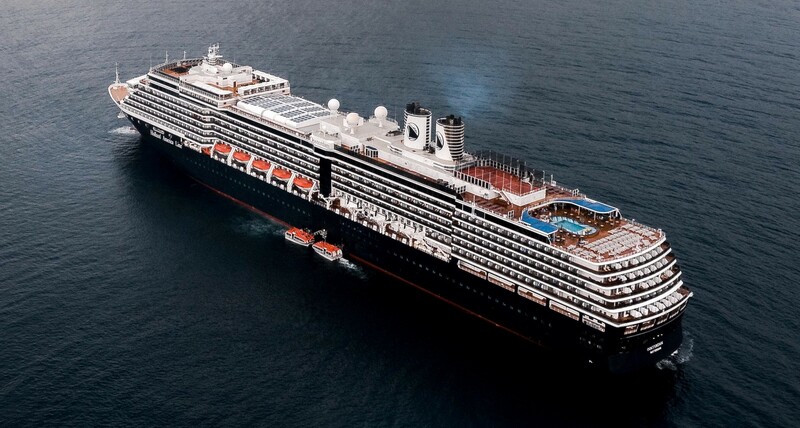 A Holland America ship in the Dominican Republic. Photo: Nestor Pool, Unsplash. In late January, following a two-year undercover investigation, environmental NGO Stand.earth published a study that suggests Carnival Corporation, the world’s largest leisure-travel company, may be exposing its passengers to hazardous levels of air pollution. 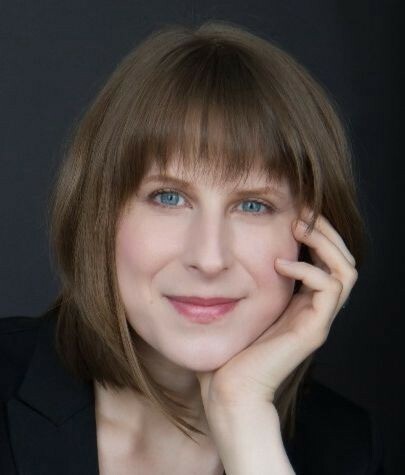 As part of our Ask an Advocate Anything series, Future 500 invited Stand.earth senior shipping campaigner Kendra Ulrich to share her take on the research, the company’s response, and what she hopes will happen next. You’ve received a lot of media attention from this new report. What has been the response from the company? We expected that they wouldn’t like the report. But the response was knee-jerk and aggressive. It made me wonder if they had seen the press advisory that we had put out a couple days prior. They should have seen the advisory but I don’t think they did, because Carnival’s response was over the top; it was very Trumpesque. There were a lot of parallels with what they are saying and with some of the things that Big Tobacco said back in the 90s. They were really trying to dismiss the science. Is there any truth to the company’s claims that the science wasn’t solid? Give us the highlights of your findings. What did the research reveal? Dr. Kennedy found levels of ultra-fine and nano-level particulate matter that are comparable with, and sometimes worse than, [those in] the world’s most polluted cities. There is a lot of research going on right now to find out exactly the health effects are of these particles, they may be even more harmful than PM2.5 [particulate matter smaller than 2.5 microns]. They are so small, that they [may be] able to bypass the body’s defenses. Is there something about inhaling these particles while aboard a cruise ship that should be of particular concern, more so than other sources of exhaust, such as idling your car in gridlock? 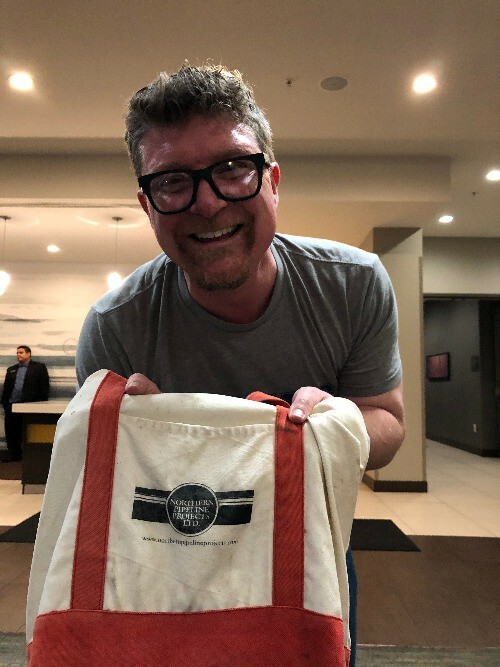 Dr. Ryan Kennedy of the John Hopkins Bloomberg School of Public Health shows the canvas bag that he used to conceal the instrument that he used to measure emissions while aboard Carnival Corporation ships. We were getting the highest readings at the upper-stern areas on the ships; these are the areas where people are encouraged to exercise outdoors. On one of the Carnival ships, there was a running track around the smokestack. I am a runner myself and the idea of running around the smokestack was just shocking to me. I can’t imagine why anyone would think that is a great idea. On the ship I accompanied Dr. Kennedy on, the Emerald Princess, that ship had a walking area, basketball court, bocce ball, places where families were bringing their children to play outside. That is very concerning. Nobody wants to breathe in this level of particulate matter, but certain populations are more vulnerable–children, or anyone with asthma or respiratory diseases or illnesses. Why is Stand singling out the cruise sector? Don’t ocean-going cargo ships represent a much larger source of air and climate pollution than cruise ships? Even though they are a small part of the overall shipping emissions problem, [cruise] ships are going to some of the most ecologically fragile places in the world, and some of the most culturally important places in the world. [Places like] the Norwegian Fjords and the British Columbia coast, where you have Northern- and Southern-Resident Orca populations that are endangered and threatened, places like the Great Barrier Reef, the coral reefs down in the Caribbean. Cargo ships are not regularly working the Norwegian fjords, but [cruise] ships are very close to the shore. 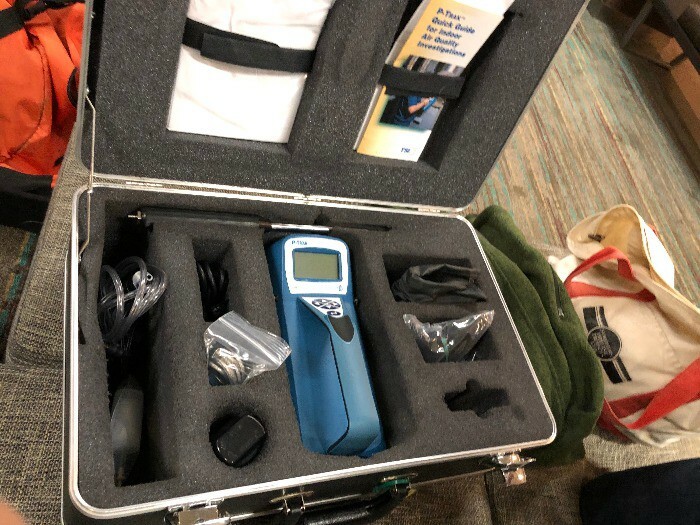 Dr. Kennedy took measurements using this P-TRAK Ultrafine Particle Counter. Using this instrument, he measured air pollution every second for one minute, and created an average for each minute. Are there air-quality rules that cruise companies must comply with in these regions? A lot of places are pushing back on the cruise sector because of air-emissions concerns. Venice has been fighting, for years, to control cruise ship traffic. Norway is considering banning all emissions from cruise ships, including water discharges, inside their fjords. That is really critically important. That is why we have focused on the cruise sector. Not only are these ships problematic, and have a lot of issues, but they are going places that are not trafficked by other kinds of vessels and [that] are very fragile, both culturally and environmentally. Why did you choose to target Carnival over another cruise line? Aren’t air quality and pollution issues endemic to the industry? Carnival Corporation is the largest actor in the global cruise sector. They have well over 40 percent of the global market share, they have 10 brands globally that operate in oceans around the world. And what this cruise industry giant does sets the standard for the rest of the industry. For example, they were one of the first to move forward with installing exhaust-gas cleaning systems on their ships. Then we saw uptake in the rest of the sector, and we are seeing that ripple out to other areas of the shipping industry as well. Wait, isn’t that a good thing? The exhaust-gas cleaning systems remove the material from the exhaust and put them into the ocean using systems called open-loop scrubbers. There are such significant water-pollution concerns with those scrubbers that some countries are now banning them. Now [Carnival is] trying to push back on that and say that the water discharges are not a concern. Clearly, taking pollution out of the air and discharging it into the water is not a solution. Give us some examples of places that have banned these open-loop exhaust gas scrubber systems? China and Singapore, and jurisdictions like California, have already banned scrubber-effluent discharge. Norway is considering a similar ban. Key ports in the UAE have just banned the discharge of scrubber effluent, as well as ports through Europe. There is growing concern about using these [open-loop scrubbers] as a compliance mechanism for sulfur emissions, and that is because countries are recognizing that there are significant contaminants in the wash water. What are you asking Carnival to do, then? What should the company be doing differently? Right now, in the immediate short term, what they could begin to do to address their pollution problem, is switch to low-sulfur marine gas oil, which is the cleanest burning fuel available. They would install catalyzed diesel-particulate filters. These would address the ultra-fine and nano-level particulate pollution. Then they could really invest in clean-shipping technologies. There was a recent story in Trade Winds about the promise of [hydrogen] fuel cell technology, and the fact that cruise ships could run on fuel cells. I know that Royal Caribbean is investing in a pilot-project fuel-cell-powered ship. If those fuel cells are created using renewable energy, this is a very low-carbon option. Is Carnival looking into hydrogen fuel cells? Unfortunately, no. Rather than look at hydrogen fuel cells, Carnival is moving towards LNG as a solution, which is very concerning. LNG creates a whole other set of problems, from the fracked [natural] gas, all the way through transportation, to bunkering, to combustion in the ship engine. There are fugitive methane emissions — a greenhouse gas that is 30 times more potent than carbon. It is very clear that going from one fossil fuel to another is not going to get us to the carbon equivalent reductions we need in order to meet the [targets in the] International Maritime Organization’s greenhouse gas reduction strategy that was just passed in April 2018, much less [those in] the much more ambitious Paris Agreement. Why is an organization that campaigns to stop fossil-fuel development calling on the cruise industry industry to switch from one flavor of petroleum to another? Marine gas oil is so important is because there is nothing the companies need to do to the engine to burn the cleaner fuel. Compare this with LNG. Shipping companies like to pitch LNG as a “bridge fuel.” But in order to swap the ship over to LNG, the ship has to be completely retrofitted with a totally different engine, or they need to build an entirely new ship designed to run on LNG. If you look at some of the cruise ships sailing around out there, one of them was built in 1988. Well, the Soviet Union was still around in 1988. I was in the first grade! That’s a long time. So, in other words, these ships are very long-term assets. An entire new infrastructure would have to be built to support bunkering of LNG and entirely new ships that are going to be in service for very long periods of time. We don’t want to create fossil fuel lock-in; we need to get to decarbonization. So building all new infrastructure to support another fossil fuel, which is not to get us where we need to go, is also not a climate solution. Carnival knew it had an air-quality problem, so it spent half a billion dollars adapting the emissions-scrubbing technology for cruise ships. Should the company not be recognized for trying to get out in front of this issue? It certainly appears they were being proactive when they installed exhaust-gas cleaning systems. In fact, the International Maritime Organization had passed Emission Control Areas, these are for sulfur. One went into effect in 2012, in the U.S. Caribbean, one went into effect in 2014. Carnival immediately applied for an exemption for enforcement while they started to install scrubbers on their ships. Just like with the impending 2020 regulation, there is a provision — what I would characterize as a loophole — that allows for compliance for using the exhaust gas cleaning systems with the sulfur cap. 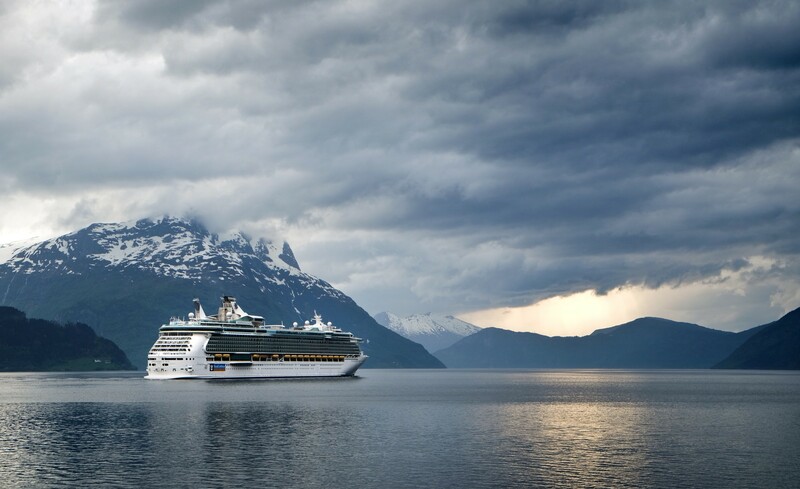 A Royal Caribbean ship sails up the Nordfjord. The Stand.earth study did not include Royal Caribbean ships. Photo: Steinar Engeland, Unsplash. So you’re suggesting this was about money, not air quality? It appears that they looked the regs and said, “It is cheaper for us to install these scrubbers rather than use a cleaner fuel on our ships.” It looks very good on paper but, in reality, they were pursuing this loophole that allowed them to get away with continuing to use one the world’s dirtiest fossil fuels on their ships, while also creating a marine contamination problem. Setting aside air quality, what about carbon emissions? This was not in scope for your study, but how is Carnival faring on that front? You can go on the Carnival website and see this nice downward-trending line of their carbon emissions. What is really important to understand is, that is an intensity reduction target. It is based on a metric called Available Lower Berth kilometers (ALB-KM). That is, the passenger capacity of the ship, divided by how far they are traveling. While Carnival has been showing this downward-trending line, its absolute emissions have been increasing, for over a decade. For the overall cruise sector, they reported that their intensity reductions decreased by six percent but their absolute emissions increased by six percent in that same period. So again, with this campaign, you are targeting a market leader with the hope that a corporate policy decision it makes will ripple throughout its sector? What Carnival does can set a significant precedent. The other important thing is, because they are such a huge player in the sector, they have an out-sized influence on the policy positions of the trade-industry organizations. The Cruise Lines International Association represents the cruise sector at the negotiations at the International Maritime Organization (IMO). So again, it has significant influence over policy discussions at the IMO. Not really. A lot of companies present what they are doing as very sustainable when in fact that is not the case. This is a common theme of corporate campaigning. One of the things about the way we approach this is, yes, we run very high-profile, hard-hitting campaigns, and yet we are very careful. We are not saying Carnival is run by bad people, or is a bad company. What we are saying is their practices and policies are not aligning with their own higher standard. They say that sustainability and the environment are very important to their core company values, and yet they are fueling their ships with what is effectively a refinery waste product. This is bottom-of-the-barrel sludge. It is high in toxic heavy metals, nitrogen, sulfur, aromatic hydrocarbons, which are endocrine disruptors and known carcinogens. So, in effect, you’re asking Carnival to walk its own talk. We are asking them to step up, to truly become the leader that they say they are, and to end their use of heavy fuel oil in their global fleet — but particularly starting with the very fragile regions of the Arctic and Subarctic. Once an activist group like Stand applies enough pressure to a company through a campaign like this one, we find that the company will often sit down with the group eventually to negotiate a resolution. Have you had that conversation? Is that on the horizon at all? Before we even launched the campaign, we reached out to Carnival’s leadership. They have been very reluctant to talk to us. We did have a meeting with their leadership in October, during the Marine Environment Protection Committee meeting in London. It was a delegation of Arctic First Nations leaders, as well as eNGO representatives, that are all part of a global coalition called Clean Up Carnival. We went to Carnival’s UK headquarters, we met their leadership, we spoke with them on the phone. They promised to give us their testing data from their exhaust-gas cleaning system and water discharges, but nothing has since happened. We have followed up with them a number of times. In the month prior to releasing the John Hopkins research, our executive director reached out to their leadership, three or four times, and we were completely ignored. So we had no choice but to move forward with the campaign plan. We are open and would like to have a dialogue with the company. And certainly hope we will have that constructive dialogue going forward. The Carnival spokesperson, in news stories about your new report, implies you have a hidden agenda, that this report is basically just a glorified fundraising scheme. What is your response to that? They do have this victim mentality. It is a bit amusing, and ironic, to have a multi-billion-dollar corporation accusing a nonprofit organization of being motivated by money. I think they’ve missed the whole nonprofit bit, and what that means as far as a civil-society organization is concerned. The spokesperson for Carnival tends to be quite aggressive in his responses. That is the person we had been reaching out to. They didn’t know the report was coming because they never responded to our requests for a meeting. They refused to respond in any way. Had they opened the lines of communication, had we been in a negotiation, this would have been different. But the company refused to talk to us, or engage in any kind of constructive dialogue. The spokesperson in question also suggested, in his remarks to reporters, that your study was, shall we way, less than rigorous…? We were very careful to use a very conservative methodology. One of the things we did was to make sure all the data was published. Even in a peer reviewed journal, those data tables would not published. It is complete transparency. Anyone who wants to peer review this — scientists, regulators, public health experts — now has the data to do so. If Carnival has data of ultra fine and nanolevel [particulates] that disprove Dr. Kennedy’s findings, the obvious thing to do is release the data. They have not done so. Instead, they have made these broad brush statements. So by releasing the data, you are going with an open-source approach to peer review? Exactly. We think the public have the right to see the raw data on what they are potentially being exposed to. All of that was included. Also, there is a reason we didn’t try to do the study at Stand.earth. We went to one of the world’s leading public health institutions, partnering with one of their associate PhD professors. He designed and implemented the study. We funded it. John Hopkins is not known for hiring people who do fake tests. Clearly you hit a raw nerve with this company, and possibly this industry. This is a sensitive issue. A lot of the push back on cruise ships, from port communities and others, relates to their air pollution. So they had a very aggressive knee-jerk response, rather than a circumspect response. Are you ultimately looking for corporate leadership here, or regulation? A company doesn’t have to wait to be forced by regulation to take action. They can change their practices and set the standard. If Carnival committed to science-based targets, we would tout them to be taking true action. Just like you did with Levi Strauss & Co? Exactly. Where we are at right now is pretty typical. We start out, and the company doesn’t like you very much, and then hopefully you are soon talking to each other and realize you have the same goals. And then you together figure out the way to get there. That is the coming together stage, and that is certainly something that happens sooner than later. We are asking them to take that leadership role, and if they did, we would publicly praise their leadership. Does it have to come to a “name and shame” campaign to force that change? No, there have been many cases where we approached the company in advance, and they were willing to talk to us without a public campaign. There are companies willing to sit down and say, “Yeah, we do have an issue here. Let’s talk solutions and not go to a public campaign.” It’s preferable to us to not have a public campaign. What do people get wrong about Stand.earth? One of the things I really appreciate about Stand.earth is that this organization really goes the extra mile to say that we don’t view companies as the enemy. We view them as entities with whom we have a temporary disagreement on certain practices. We approach campaigns with humor. Protest is not our default. So if a company suggests you are “anti-business,” how do you respond? Carnival’s survival strategy is to continue on with scrubbers, but most of the shipping sector is switching to cleaner fuel. There are some that are increasing their scrubber orders. The compliant fuels, the low sulfur fuel, is going to become more abundant. There will be an initial adjustment period in terms of markets and costs, but over the long term this will equalize. [Switching to marine gas oil] is not going to bankrupt the company. It will be harder to access heavy fuel oil. We are hearing reports that some refineries are trying to lock companies into heavy fuel oil now because they are concerned about not being able to sell it. They want to get rid of it; on land, it is basically hazardous waste. If I was a senior Carnival executive, sitting across the table from you right now, what would you say to me? Kendra Ulrich will join approximately 100 executives, advocates, investors, and philanthropists from across the United States and beyond for the Future 500 Summit at EarthX — America’s leading gathering dedicated to effective stakeholder engagement.